My name is Frank Salinas and I live just outside of Chicago, IL. I’m originally from Houston, TX and grew up in a small town just south of it called Alvin. I’ve been at home full-time since September 2007. I've finally made it to where I can provide for my wife and our 3 sons and not worry about money like I did before when I was working in shipping and receiving. If you work daily on your business...learn, take action, learn, take action… the hard work does pay off. Never give up. Internet Marketing sites of mine:. 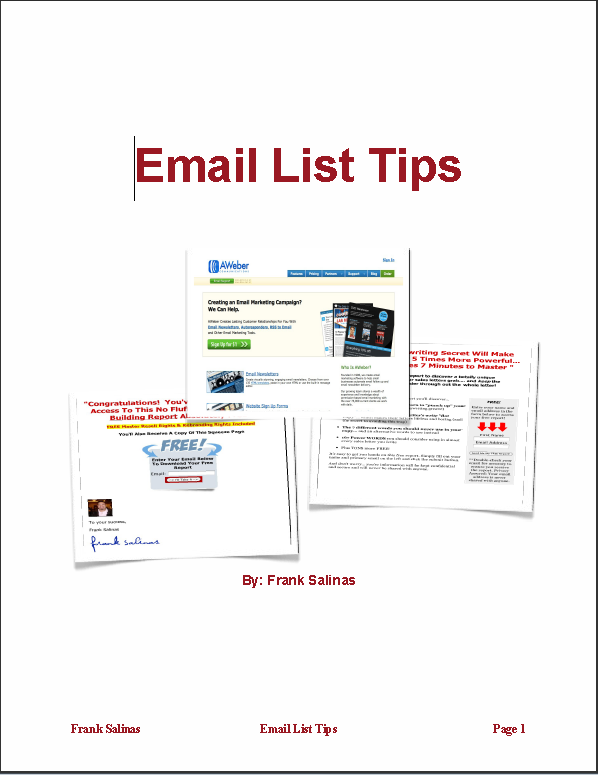 As A Special Thank You Gift For Visiting I'd Like To Offer You My $97 Value Special Report "Email List Tips" Absolutely Free!